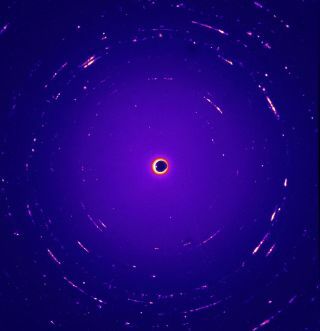 This false color image shows a diffraction pattern from the first interstellar dust candidate Orion, collected by NASA's Stardust spacecraft in 2004. Seven tiny grains of rock captured by NASA's comet-chasing Stardust probe in 2004 may be visitors from the vast reaches of interstellar space, researchers say. These interstellar dust motes from Stardust are fluffier and more diverse than expected, findings that could one day shed light on the origins of the solar system, scientists added. "By analyzing interstellar dust, we can understand our own origins," said lead study author Andrew Westphal, a planetary scientist at the University of California at Berkeley. "Just as people go to Africa to look for fossil hominids, say, 4.5 million years old, trying to understand the origins of humanity, we want to look at stuff that helped form the solar system 4.5 billion years ago." But while Stardust captured samples of Comet Wild-2 on one side of the craft's collector tray, the other side was pointed away from the comet to catch bits of interstellar dust in a stream emanating from about the direction of the constellation Ophiuchus. The tray was exposed to space for 195 days to capture particles in tiles of silica aerogel, a porous material resembling frozen smoke, which possesses a sponge-like structure that is 99.8 percent air. Now, nearly a decade after Stardust's samples reached Earth, a preliminary analysis of the material suggests that seven of the dust motes the probe caught may have origins outside the solar system. If that is confirmed, these tiny flecks of rock will represent the first specks of interstellar dust a spacecraft has ever returned to Earth. "These are the very first contemporary samples of solid material from outside the solar system that we've identified," Westphal told Space.com. "Instead of looking at interstellar dust with telescopes, now we get to look at samples we collected from space with microscopes." The keystoning apparatus cuts a picokeystone out of NASA's Stardust spacecraft interstellar dust collector at the Johnson Space Center in Houston. The scientists enlisted the aid of volunteers around the world in the Stardust@home project. These citizen scientists, who called themselves "Dusters," helped study more than a million digital images of the microscopic impacts that particles made on the aerogel and on pieces of aluminum foil on Stardust located between the aerogel tiles on the collector tray. "The Dusters as a community are really good at finding tracks, much better than we are," Westphal said. This image shows a top-down view of a dust particle impact on NASA's Stardust spacecraft Al foil collector. The researchers and citizen scientists analyzed 71 tracks that particles made as they crashed into the aerogel tiles. The analysis was unable to identify two of the tracks, but revealed that 66 were caused by spacecraft debris, leaving three potential grains of interstellar dust. Their discoverers named these particles Orion, Hylabrook and Sorok. Bruce Hudson, a retired carpenter in Ontario, Canada, chose the name Orion due to his affinity with space; Naomi Wordsworth, in Buckinghamshire in England, took Hylabrook from a poem by Robert Frost; and Westphal and his colleagues named Sorok. "Sorok was track 40, and 'sorok' means 40 in Russian," Westphal said. The scientists also looked at 25 craters made on Stardust's aluminum foil, which was not originally planned as a surface to collect interstellar dust. Four of these pits were lined with partially melted residues that were chemically different from anything on the spacecraft, hinting they came from interstellar dust. "They were splatted a bit, but the majority of the particles were still there at the bottom of the crater," study co-author Rhonda Stroud, a physicist and nanoastronomer at the Naval Research Laboratory in Washington, D.C., said in a statement. NASA's Stardust probe visited two comets during its mission. See how NASA's Stardust mission worked in this Space.com infographic. The interstellar dust motes Stardust collected are extremely tiny. "Three of the biggest particles weigh roughly 3 picograms, or trillionths of a gram — a trillion of them would fit onto a teaspoon," Westphal told Space.com. "The other particles are more like a femtogram in mass, which is a thousand times smaller than a picogram. All in all, the amount of interstellar dust Stardust captured was less than a millionth the amount of cometary material it collected." The researchers analyzed these dust grains using powerful microscopes. "One X-ray microscope we used is the Advanced Light Source at Lawrence Berkeley Laboratory, which is a synchrotron the size of a small shopping mall," Westphal said. "Others we used are the Advanced Photon Source near Chicago and the European Synchrotron Radiation Facility in Grenoble, France, which are the size of large shopping malls. These are instruments we could never hope to fly in space — that's one major advantage of sample return missions." These seven grains proved surprisingly diverse in size, composition and structure. The small ones differ greatly from the large ones, and may have experienced different histories. "The relatively simple picture of interstellar dust grains more or less having the same structures is not right," Westphal said. "Each particle must have its own individual complicated history." Three of the particles also contained sulfur compounds. This is significant, as some astronomers previously argued sulfur does not occur in interstellar dust particles, the researchers said. In addition, many of the bigger particles were unexpectedly fluffy, made up of an agglomeration of other particles. By contrast, the simplest models of interstellar particles suggest the motes should each consist of a dense particle. "The fact that the two largest fluffy particles have crystalline material — a magnesium-iron-silicate mineral called olivine — may imply that these are particles that came from the disks around other stars and were modified in the interstellar medium," Westphal said in a statement. "We seem to be getting our first glimpse of the surprising diversity of interstellar dust particles, which is impossible to explore through astronomical observations alone." Scientists have previously looked at interstellar dust grains within primitive meteorites, and have also used aircraft to collect interstellar dust motes in Earth's stratosphere that probably came from comets. However, these are not contemporary interstellar dust grains like the ones Stardust returned. "We think those are much older than the solar system, survivors of the violent process involved in converting the solar nebula into the solar system," Westphal said. "They don't fully represent what interstellar dust is like, since they had to be tough to survive, while other stuff that is more fragile did not survive well at all." In comparison, the dust from Stardust "is relatively new, since the lifetime of interstellar dust is only 50 to 100 million years," study co-author Anna Butterworth, a research physicist at the University of California, Berkeley, said in a statement. "We are sampling our contemporary galaxy." The amount of interstellar dust particles Stardust collected is unexpectedly small based on observations of interstellar dust carried out by the earlier Galileo and Ulysses space probes, Westphal said. "The number of particles Ulysses and Galileo saw was much larger than accounted for by astronomical observations of interstellar dust," Westphal said. "Our observations are more in line with the astronomical observations." One possible explanation for this discrepancy comes from the fluffiness some of the particles. "The pressure from sunlight is significant on such particles, and if the particles are sufficiently fluffy, instead of accelerating toward the solar system because of the sun's gravity, it might not make it into the solar system." In other words, when interstellar dust tries to get close to the sun, sunlight might be pushing many of the particles outward with more force than gravity draws them inward. Ulysses and Galileo may therefore have seen more interstellar dust particles than Stardust because they were in more-distant regions of the solar system. A taste of interstellar space? Westphal cautioned that the researchers still need to carry out additional tests before they can definitively say that these are pieces of debris from interstellar space. The scientists will analyze oxygen isotopes in the specimens; stable atoms of oxygen have anywhere from eight to 10 neutrons in their nuclei, and matter in the solar system has proportions of these distinct isotopes of oxygen that differ from materials found elsewhere in the galaxy. The potential interstellar material is difficult to analyze because there is so little of it. However, "instruments do exist to do these measurements, ones that did not exist when the spacecraft was launched," Westphal said. "That's the huge advantage of having sample- return missions. You can use state-of-the-art technology you could never fly in space, and that did not exist when the missions flew." The scientists noted that more interstellar dust could be discovered from the Stardust collector trays. An additional 100 tracks found by Dusters have yet to be analyzed, and only 77 of the 132 aerogel tiles have been scanned to date. Westphal said he expected to find no more than a dozen particles of interstellar dust in total. "I invite people to participate in the ongoing Stardust@home project, and just have fun looking for interstellar dust," Westphal said. "Citizen scientists are making real contributions there." Westphal noted, "This is only the first glimpse we have of the diversity and complexity of interstellar particles. It's too early yet to take what we've learned about the interstellar medium here to learn more about the formation of the solar system, because we have so few particles in our collection. What we want now is a new mission whose goal is collecting hundreds or thousands of particles, not just a small handful." The scientists detailed their findings in the Aug. 15 issue of the journal Science.